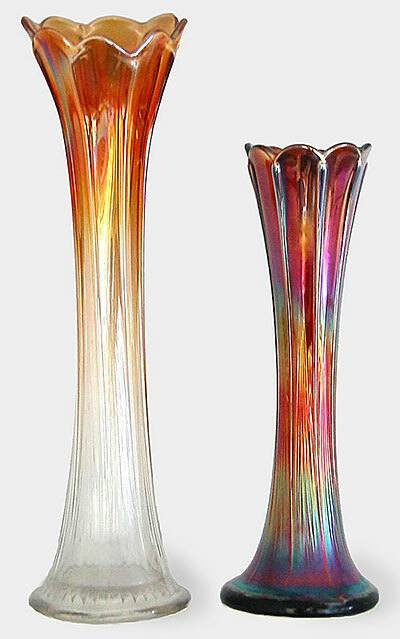 With its fine ribs at the bottom, morphing into flutes at the top, this vase is often a puzzle to identify. There were at least two different moulds for this vase--one with a 30-point star on the base and one with a 32-point star. The configuration of the flutes at the tops are different as well. The few 32-point star examples I've seen have all been marigold, often with iridescence on the top half only. The 30-point star examples I've seen have been amethyst. Heights generally range from about 11 to 15 inches tall. The only confirmed vase in this pattern that has sold recently was an 11-inch marigold that brought $10 in 2014.